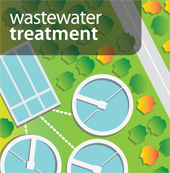 Wastewater treatment is necessary to protect our water resources. The Regional District operates four wastewater treatment facilities, 23 pump stations, and two septage receiving sites to transport and treat wastewater from about 110,000 sewered homes and businesses between Qualicum Beach and Duke Point that are connected to sewer. What Odour Controls are in place? Property owners not connected to sewer, largely those residing in rural areas and island communities, are responsible for their own wastewater treatment and often use privately-owned septic and onsite systems. A small number of properties are authorized by Island Health (VIHA) to use pump and haul services and the RDN receives and treats holding tank waste from these properties as well as septage from pumped septic tanks. Visit our SepticSmart page for homeowner information on septic systems.